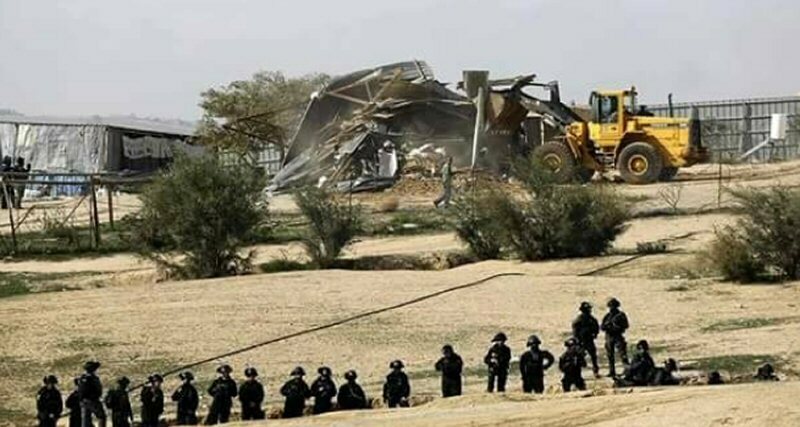 photo: Israeli forces cordon off the area while bulldozers demolish Bedouin Palestinian community. The policy of Judaization and ethnic cleansing practiced by Israeli occupation authorities, to displace the Palestinian population from their land, restrict their life, and to expand settlements and military areas, are continued, in violation of international law, based on discrimination, racism and hatred. According to information from the “Sant Eif” organization, which specializes in following up the legal matters, has said that the occupation government and its army have called for the transfer of the administrative demolition to the West Bank “C” areas, which means giving Civil Administration extensive powers to demolish houses and facilities, without referring to the courts. Thus, it has issued a military order to remove the new buildings and to demolish any building under construction within six months. The military order includes any residential building that does not exceed 30 days from the date of entry into force, even if the building is completed. This military order comes into force on 17-4-2018, signed by the military authority. These military orders are part of the policy of forced displacement adopted by Israeli occupation authorities, and aim at displacing the Palestinian population from their land and tightening the siege, to expand settlements and the military areas, which is a serious violation of international humanitarian law and amount to war crimes based on discrimination and ethnic cleansing. On the other hand, the chapters and repercussions of the Nakba, along with the massacres of Palestinian cities and villages, coincided with the opening of the American Embassy in Jerusalem, and the American administration’s recognition of it as the capital of Israel, in violation of international law and resolutions of international legitimacy, including Security Council resolution 478 , which asserts that East Jerusalem is occupied territory, and that the issue of Jerusalem is a final status issue, and its future must be resolved through direct negotiations. Within this context, two-thirds of the members of the UN Security Council expressed deep concern over the failure to implement a resolution in 2016, calling for an end to Israeli settlement construction in the occupied West Bank. The UN’s envoy to the Middle East, Nikolai Mladenov, told the Council, last year, that Israel was putting an end to the demand for a halt to settlement construction. The National Bureau considered that the decision of the Palestinian leadership, to refer the settlement file to the International Criminal Court (ICC), is an important tool for submitting complaints and prosecuting the occupation leaders, as settlement advancement and ethnic cleansing constitute war crimes. On the eve of the transfer of the US Embassy to the occupied city of Jerusalem, the Israeli government decided to allocate 2 billion NIS (New Israeli Shekels) to strengthen Israeli sovereignty in the eastern part of the city, besides an allocation of about NIS 350 million for developing the surrounding areas of the Old City, including the organization of Jewish events on the Mount of Olives, in addtion to upgrade of the quality of cleaning and maintenance services in public places, and the restoration of the Jewish cemetery at the Mount of Olives. At the same time, the Israeli government has given the green light to invest US $56 million for a cable car project linking West Jerusalem to the old town of East Jerusalem. Israeli Tourism Minister Yariv Levin said, on the eve of the official transfer of the US embassy from Tel Aviv to Jerusalem, “This project will change the face of Jerusalem, because it will facilitate the arrival of tourists and visitors to the Western Wall. The cable car, which has a length of 1.4 kilometers, can transport 3,000 people [in] an hour, in both directions, at 21 kmph. According to his estimations the project will be operational by 2021. In addition, the Municipality of Nir Barak is supporting and encouraging the government to construct four buildings in the Gilo settlement project, to the south of Jerusalem, each of which includes 22 housing units. This will increase the number of housing units in each project by 88. The housing units will be different in size, and cost between NIS 2 million and NIS 2.7 million in 2019; 12 units have already been sold. According to Avi Tservati, Deputy Director General of Tsrifati Shimon, who oversees the construction of the “Tsrifati Pisgat Ze’ev” project, a total of 2,164 housing units have been built in Jerusalem since the beginning of the current decade. Building permits issued in 2016 and 2017 are the most important factors in the increased number of buildings, most of which are located in Pisgat Ze’ev. The new project includes the construction of 92 new housing units in four buildings, 2 of which are 7-8 floors tall and 2 others 6-7 floors, each floor consisting of 3 residential units. According to Hebrew sources, American Ambassador to Israel David Friedman financed the organization of the Friends of the Religious School “Commute” in Beit El, in 2013, for $US 12,000, with the aim of foiling any attempt to evacuate any Jewish settlement in the West Bank. 05/15/18 70 Years of Nakba: Where Can Palestinians Go from Here?